Aerith's original Japanese name is エアリス Earisu, pronounced [eaɾisɯ] ( listen). This was transliterated to "Aeris" in Final Fantasy VII and Final Fantasy Tactics, but in later products has been changed to "Aerith". Both transliterations have basis, as the Japanese "su" (ス) is used when transcribing "s" (/s/) and "th" (/θ/) to Japanese. 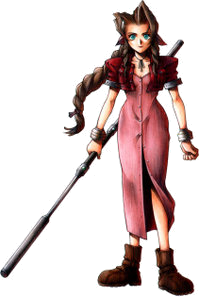 However, official Japanese material uses the spelling "Aerith", and developers have stated that "Aerith" is a near-anagram of "Earth". Prior to the game's release, Western gaming magazines, such as the May 1996 issue of Computer and Video Games, also referred to her as "Aerith". ^ "Top 10 Tuesday: Best Videogame Romances". IGN. 14 February 2006. Archived from the original on 2011-06-29. Retrieved 18 July 2010. This page was last edited on 11 April 2019, at 00:18 (UTC).